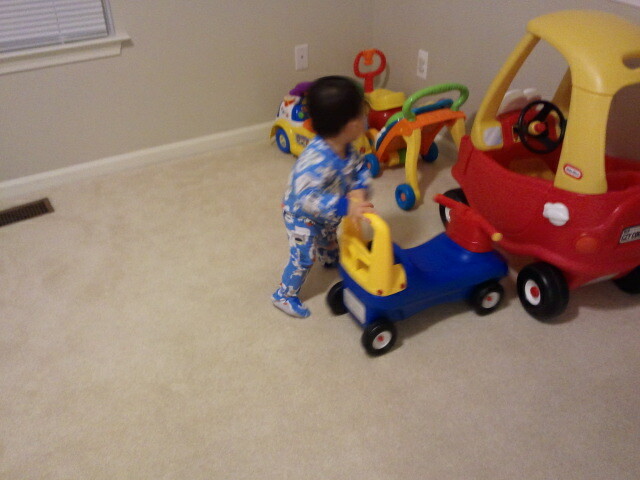 My son’s current favorite toys are kid-sized vehicles: scooters, walkers, cars. He received an array of vehicles for his birthday, so he’s been pushing them around the house, laughing gleefully as he whizzes around. The problem with this, however, is that he doesn’t want to walk on his own because he is afraid to let go of the vehicles. So, it was a heart-wrenching decision, but my husband and I decided to hide all the toy vehicles so that he can learn to take steps without them. The funny thing is, I feel really really bad now. I wonder if he’s thinking to himself, ‘Where did all my favorite toys go?” The most sad part to me is that I know how much joy it brings him when he can push the vehicles around, so it breaks my heart that he can’t experience that joy now. I know it sounds overly dramatic, but I really do feel that bad! As I thought about this, it suddenly hit me – this is how it must feel when God has to take things away from us, for our own good. Sometimes there are things in our lives that are not inherently bad, but they may be inhibiting our spiritual development, so He needs to strip them from us for a period of time. Once our son starts walking, my husband and I will bring the vehicles back because he’ll have learned to walk without them. We’ve only taken them away temporarily, but we had to in order to help him grow the courage to walk without them.